BY TINA BENITEZ-EVES | To mark the one-year anniversary of the catastrophic gas explosion that killed two men and ignited a raging inferno that destroyed three East Village tenements, Councilmember Rosie Mendez and other local politicians and agency officials on Saturday held a “Day of Remembrance” press conference outside the tragic site. Reverend Jacqui Lewis, senior minister of Middle Collegiate Church, gave the opening remarks and led the crowd in a moment of silence for the two victims, Moises Locón, 27, and Nicholas Figueroa, 23. In addition to individuals who were displaced after the calamity, also on hand were firefighters and other first responders — including Ladder Company 9, Engine Company 3 and local volunteer Community Emergency Response Team, or CERT, team members — who rushed to the scene of the disaster one year ago. “We can never forget the tragedies that were avoidable, and we vow to work to ensure that no one else has to suffer and endure what the families and our communities have,” Mendez said. 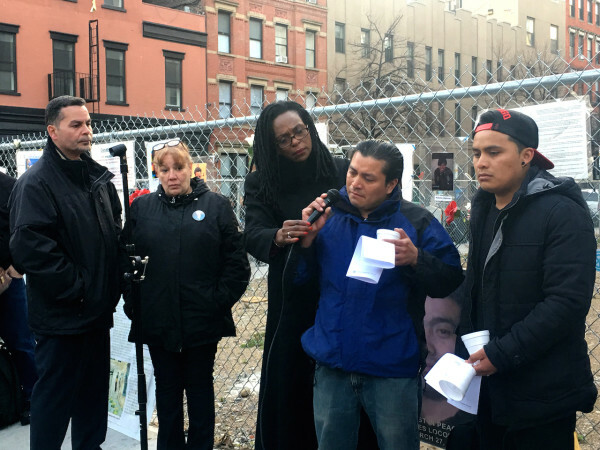 Mendez said that many of the affected former tenants still remain homeless. “We hope they can find the place they need to continue on the path toward healing,” she said. In total, 30 families were displaced and six families have since moved out of state. On that fateful day, Mildred Guy lost her home of 45 years at 119 Second Ave., which collapsed along with 121 and 123 Second Ave.
At the press conference, Guy tearfully recalled the shock of learning her family’s home — which her kids fondly knew as “Mommy’s Place” — was gone. She had lived there for most of her life in a multigenerational household. Yet, Guy said, she also felt grateful that her elderly mother, who was wheelchair bound, had passed away before the explosion happened, and that her grandson was not asleep inside the apartment, since her son had moved out with his family only shortly before the blast. 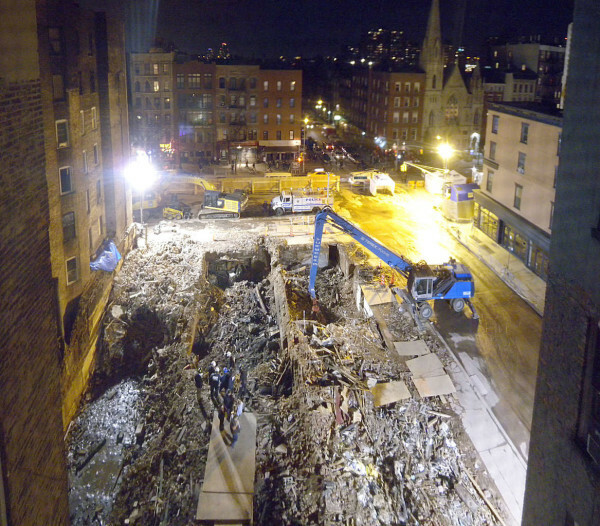 A photo taken after last year’s explosion by a Community Emergency Response Team (CERT) volunteer from the E. Seventh St. building just west of the explosion site, showing the three craters that were left where the tenements had stood. This February, Maria Hrynenko, 56, who owns 121 Second Ave. where the blast occurred, her son Michael Hrynenko, 30, contractor Dilber Kukic, 40, and plumber Athanasios “Jerry” Ioannidis, 59, were all charged with criminally negligent homicide and assault in the second degree in connection with the gas explosion. In addition, Andrew Trombettas, 57, was charged with “renting” his master plumbing license to Ioannidis, so the latter could get work on the property approved, prosecutors said. Manhattan District Attorney Cy Vance said the defendants set up an elaborate illegal gas line and hid the setup from inspectors, causing the explosion and subsequent fire. The court case was set to resume on Thurs., March 31. On March 26, 2015, Michael Hryenko and Kukic ran out of 121 Second Ave. when the basement filled with gas, never warning building residents or patrons at Sushi Park, where Figueroa was paying his bill and Locón worked as a busboy. The City Council introduced nine bills last month that, among other things, would increase inspections of gas pipe systems, require better and more informative notifications to tenants about gas-related issues, increase transparency about the cause of gas-related violations and mandate natural-gas alarms in residential units. Mendez is the lead sponsor of Intro. 1093, which would require gas providers to notify the Department of Buildings of a gas service shutoff within 24 hours. “The city of New York is committed to preventing tragedies like this from happening again,” Mendez said. A hearing on the bills is set for June. 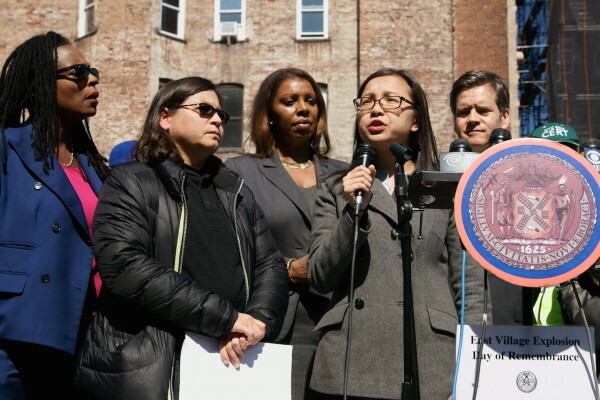 “It sends a message to building owners who might be tempted to cut corners and find justice and is another step forward toward healing and closure that our neighbors need,” Mendez said. 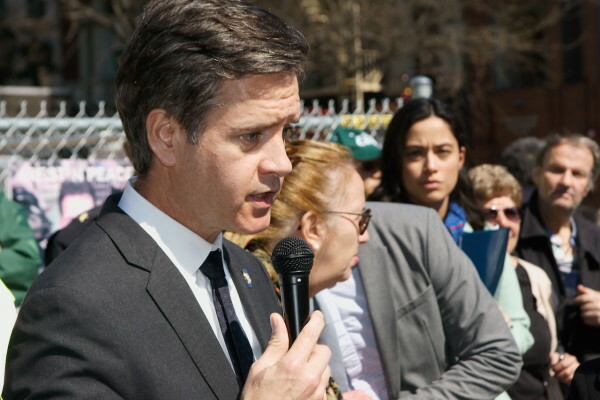 State Senator Brad Hoylman said the community still has a long way to go, and that part of the redress of justice is ensuring that none of the property owners involved see any profit from the future sale of the now-vacant properties. He added that part of the problem is that LLCs that are, in fact, “shell corporations,” need to be exposed to civil suits tied to litigation. “You know how impressive a community is, how successful a community is when it comes together like it did one year ago,” Hoylman added. 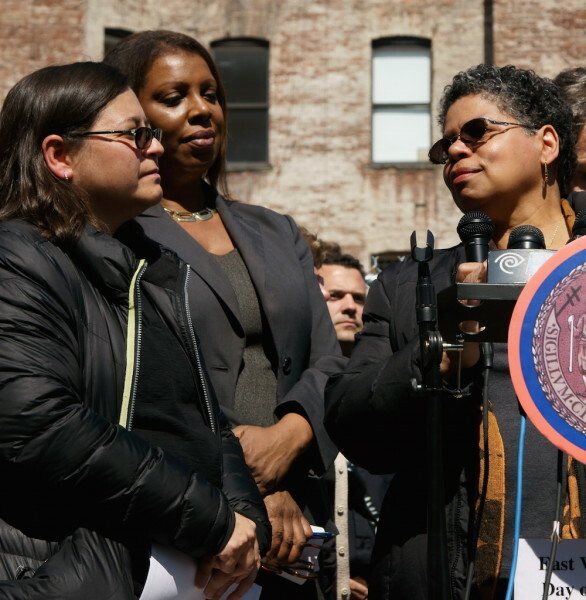 Also speaking at the press conference were Public Advocate Letitia James; Manhattan Borough President Gale Brewer; Damaris Reyes, chairperson of LES Ready and director at GOLES (Good Old Lower East Side); Gigi Li, chairperson of Community Board 3; and Tyesha Maddox, another displaced tenant, who had to vacate her apartment in the adjacent building at 125 Second Ave. Guy said it’s still difficult to walk past the empty lot where her building once stood. For a while after the explosion, Guy would walk home toward her old building on Second Ave. after work. “It took me awhile to realize that this is not my home anymore,” she said. She is now living temporarily on E. Fourth St., thanks to the Cooper Square Mutual Housing Association. And she is still working at the Neighborhood School on E. Third St., where she is a veteran of 20 years. Guy would like to see modestly sized affordable housing go up on the vacant lot, not market-rate condos. In the meantime, all she wants is to find a new place to call home permanently. 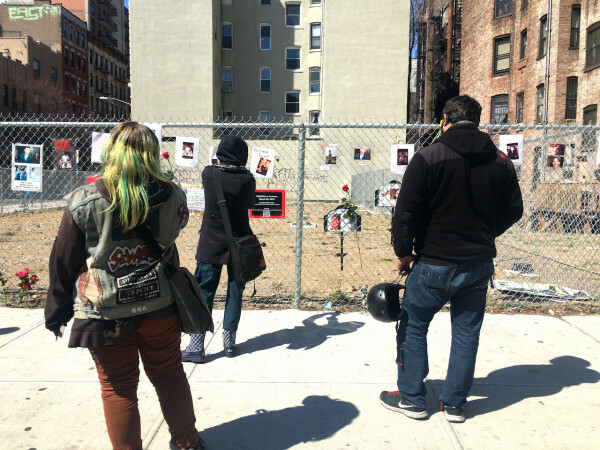 Later that afternoon, family members of the two men in their 20s who died in the disaster returned to the fenced-off lot for a memorial service for them. Joining them were local residents, business owners and anyone else who wanted to show support. Those in attendance were asked to write words of remembrance for Moises Locón and Nicholas Figueroa on small white paper bags. Inside each bag, a candle was placed, and then each bag was laid down on the rubble-strewn ground in the center of the vacant site, forming a glowing white cross in remembrance of the two men. In tears, Moises’ brother Alfredo, with his brother Zacharias beside him, shared his heartfelt remembrances about their lost sibling. Barely able to get her words out, Ana Figueroa spoke about her son. Before the vigil, The Villager spoke with Nicholas’s father, Nixon, who said that the day his son died, he died, too. He missed his father-to-son talks with Nicholas and his smile and laughter, he said. The first firefighter up the building’s fire escape that day later cut one of the fire-escape ladders down to make two crosses with a base with the initials of Nicholas’s and Moises’ names. 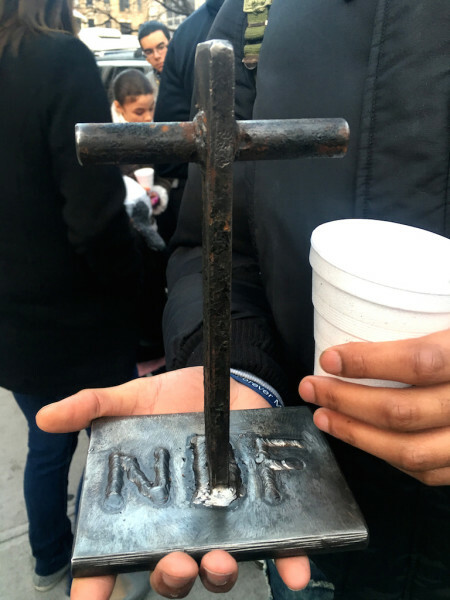 “It’s a piece of history,” Nicholas’s father said, as he gripped the two small iron crosses in his hands. “It’s something to keep the memories of my son and Moises. 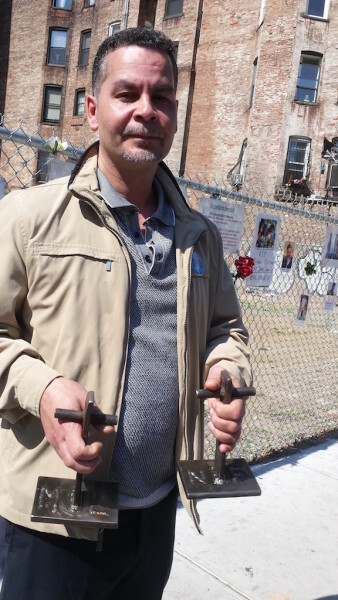 One year later, Figueroa’s parents still come down from the Upper East Side every Thursday to keep up the makeshift memorial to their son and Moises that festoons the gates around the fenced-in lot. Moises’ brothers regularly give them new photos to share for the memorial. 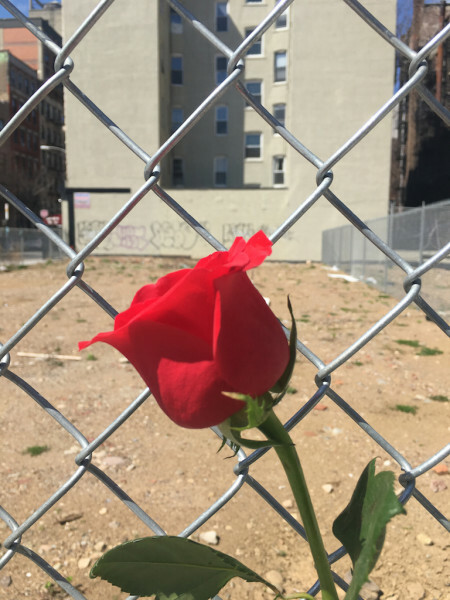 For local residents, the disaster’s one-year anniversary brought jarring memories flooding back of the tumultuous day that literally rocked the East Village. Shep Wahnon moved to the neigborhood — just a block away from the explosion site — in 1981. He remembered hearing the explosion last March, and how everything then changed. Moises Locon and Nicholas Figueroa had their whole lives ahead of them when they were killed by the explosion caused by the alleged illegal gas-siphoning hook-up. Photo by Tina Benitez-Eves. Alex Gross, who lives nearby and moved to the neighborhood in 1959, didn’t want to come out to the one-year anniversary but felt he needed to be there with his community. For sometime, Whanon would walk around the site to avoid seeing it. 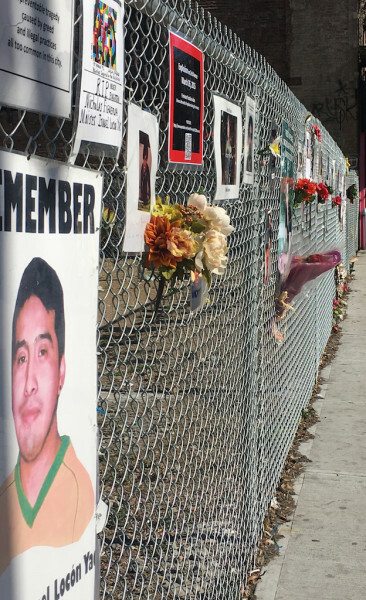 On the anniversary, he was slowly making his way around the fence, looking at photos of Lócon and Figueroa. William Goodhart, also known as The Street Teacher, has been giving tours of the East Village for 20 years. He related the Second Ave. explosion to the Triangle Shirtwaist Fire, which killed 146 garment workers on March 25, 1911. 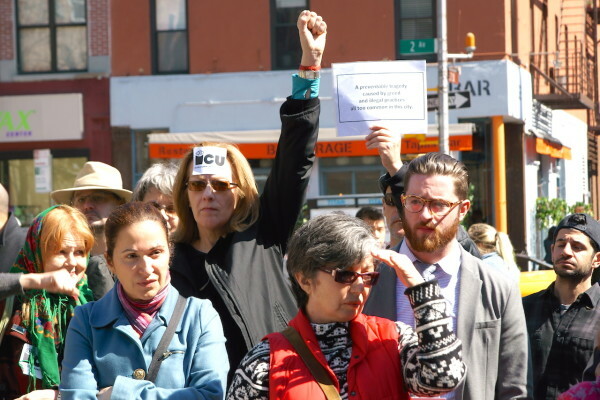 Jean Standish, vice chairperson of the Bowery Alliance of Neighbors, vividly remembers the day last March when everything changed. Whanon, like most residents, would like to see some type of memorial go up in the now-vacant lot. Standish, who has lived in the area since the 1960s, would be happy if a park filled the spot where the three buildings once stood. 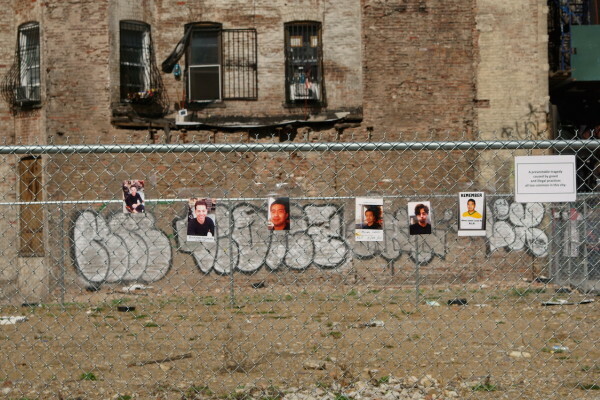 “I love that people are still putting things up on the fence,” she said. “I’d love to see a memorial park with benches, a place where people can go… . It’s a last-ditch effort for Stuart Lipsky. When he heard the explosion a year ago, he rushed to his building at 125 Second Ave. Within 10 minutes, Lipsky, a retired New York City science teacher, made it up to his apartment and grabbed one of his cats, but could not find the other — when his windows suddenly blew in. He wasn’t sure if his building would come down around him. Luckily, it survived. A tenant at No. 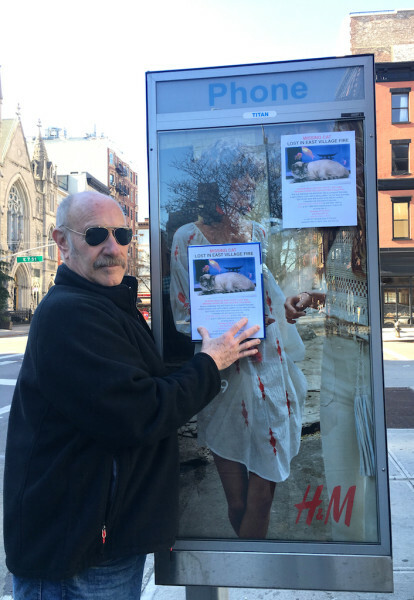 125 for nearly four decades, Lipsky last Saturday was still putting up missing posters for his cat, Ryce — who would have turned one this April 15 — in a final attempt to be reunited with his missing pet. Most tenants in his building were reunited with their pets following the explosion. But Ryce, a Lynx Point Siamese cat, has never been found. Everything happened so fast, but Lipsky clearly remembers seeing Pommes Frites, the Belgian fries place, on fire and hearing smoke detectors going off everywhere. The building didn’t come down, but his life — and the lives of so many others who were affected — was changed forever. We appreciate your comments and ask that you keep to the subject at hand, refrain from use of profanity and maintain a respectful tone to both the subject at hand and other readers who also post here. We reserve the right to delete your comment.